Snow blowing can be fun. There's nothing like clearing snow and launching it into the air. But getting cold and wet in the process usually means the fun doesn't last. With a snow cab, you can shield yourself from the cold chill of wind-whipped flurries while you forge on, putting snow in its place. Choosing the right snow cab isn't hard either, as long as you pause to consider what brand, style, and features. The easiest way to choose the perfect snow cab is to buy the same brand as your snow blower or tractor. By choosing a brand-specific snow cab, you ensure it'll fit your make and model perfectly. There are snow cabs available for nearly every major make and model of a 2-stage snowblower, and most makes and models of lawn or garden tractors. If the manufacturer’s snow cab is unavailable or out of your price range, you can choose a universal cab. 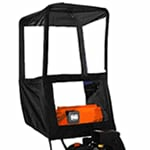 These cabs are designed to fit on a wide variety of snow blowers and are generally more affordable than brand-specific snow cabs. For snowblowers that feature a headlight, you'll want a snow cab that allows the light to shine through. To preserve the benefit of your headlight feature, you should choose a deluxe snow cab with a clear lower window that shields the lamp, but not the light. If you don’t have a headlight, you can save some money and buy a regular snow blower cab without the window. The idea here is to simply match the cab to your make and model, and ensure that it's compatible with all of your unit's features. Snow cabs come two styles - walk-behind or tractor. Snow cabs that attach to a walk-behind snow blower are smaller, covering just your head, shoulders, and hands. Walk-behind snow blower cabs typically cover the control board as well, so your hands stay dry while operating the controls. However, most snow cabs are not compatible with single-stage units. Tractor cabs offer the most protective shelter. 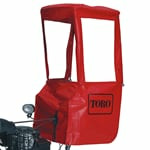 They're designed to fit over the seat and steering to provide a complete enclosure. 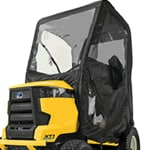 Some tractor cabs can also be used in summer as a sunshade, making them useful year-round. Snow Shelters for Tractors & Snow Blowers.. Our Power Equipment Direct how-to library can help you learn about Top-Rated & Best-Selling Three-Stage Snowblowers, Farmers Almanac Winter Weather Predictions and Proposition 65 Product Labeling.